Cherries and almonds are a classic pair and make a delicious salad combination with tart arugula and fragrant tarragon. In a blender, combine vinegar, shallot, mustard, water, 3 tbsp of the almonds and 1/4 cup of the pitted cherries. Blend until very smooth, about 1 minute. Stir in tarragon. 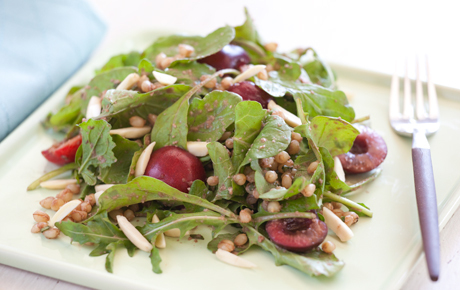 Combine arugula, cooked grains and remaining cherries in a large bowl. Toss with the dressing and garnish with the remaining 3 tbsp almonds. This entry was posted in Main Courses / Dinner, Recipes, Side Dishes, Vegetarian and tagged arugula, cherries, healthy, recipes, salad, vegetarian. Bookmark the permalink.